Abstract: When one wants premium quality memory, there are only a few names that come to mind first; Mushkin, Crucial and Corsair. When one wants premium quality memory, there are only a few names that come to mind first; Mushkin, Crucial and Corsair. A few other companies also consistently delight overclockers, but their availability is not always a sure thing (OCZ, Xtreme DDR and GeIL). Today we're going to be reviewing a 256MB stick of Corsair XMS3200 CAS2 DDR400 to see if it is as good as everyone says it is. So why do overclockers & enthusiasts hold Corsair in such high regard? Well, Corsair has been around since 1994 and they've been producing and delivering some of the best overclocking memory from our experience. They're always among the first manufacturers to deliver new speeds of overclocking memory. They released their XMS2400 right after JEDEC approved the PC2100 standard! Corsair design their own PCB's, but use qualified outside vendors to actually manufacture the boards for them. 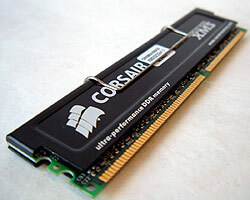 As only a few semiconductor companies manufacture the silicon DRAM's which end up in our memory sticks, Corsair again buys these components from select outside vendors. Each and every DRAM chip is tested to see if it will reach certain speeds and then sorted by how fast it will go. Using in house machinery, Corsair assembles the PCB's and DRAM chips to create the final Corsair-branded memory modules (or sticks of memory). Each new Corsair memory design (say PC2700, or PC3200 in this case) is thermally shock tested with loving care and then assembled with in house tools and QA controls to be a faster, stronger, hopefully better stick of overclocking memory. Since there is no JEDEC approved PC3200 (DDR400) standard, all the current memory on the market that's rated for 200 MHz (PC3200, DDR400) operation is technically only PC3200 compatible, so you should be aware of the potential for possible compatibility issues. As you can see, the memory is encased in a set of sleek black-aluminum heat spreaders which are attached via thermal tape and a small spring clip. Overclocked memory can get pretty hot when operating at high FSB's, so the heatspreaders help out a bit and bring peace of mind. After taking off the aluminum heat spreaders we found the "legendary" Winbond "BH-6" DRAM chips. Yes, this is the same DRAM that we saw on the Kingston PC2700 ValueRAM which was able to hit 205 MHz FSB and the TwinMOS PC2700 DDR which hit an impressive 219 MHz! The hype, and excitement is building! "Wait a minute, the XMS3200 is using 6ns DRAM!?" Remember that as there is no JEDEC approved PC3200 standard, all the memory modules out there claiming to be "PC3200" are just overclocked PC2700 memory. But hey, if it does the dance, why quibble? Before we forget to mention it, the Corsair XMS3200 runs with a CAS Latency of 2 at 200 MHz FSB. So how high will does this memory go? Will it be able to dethrone the previous overclocking champ; the TwinMOS PC2700? After plugging the memory into the DIMM slot of the Epox 8K5A2+, the first FSB speed I tried was 200 MHz while keeping the most aggressive memory timings and a voltage of 2.5V. Next I bumped the FSB up 10 MHz (yes we all know I'm impatient!) and we ran into our first problem. While loading WindowsXP, we would get a memory dump error. Raising the voltage from 2.5V to 2.7V fixed this problem. The memory was then pushed up to 220 MHz FSB and while WindowsXP would load, 3DMark2001SE would crash back to desktop (which usually means memory errors). Raising the voltage up to 3.2V didn't help things out so we had to back down the FSB. I lowered the FSB to 219 MHz (same speed TwinMOS maxed out at) but it was to no avail. The memory just wouldn't run stable at that setting.